The Hyperfreak range of Oneill Wetsuits is their highest performing range of wetsuits and in true Oneill fashion has pushed performance where no one else has gone before. In the age of 'green' wetsuits it's easy to get bogged down in mis-information but one thing we know for sure is every dollar spent on the Oneill Mens Hyperfreak Fuze 2mm Spring Suit results in the utmost performance. To get the most out of your Oneill Mens Hyperfreak Fuze 2mm Spring Suit we recommend washing it with Wetsuit Wash & reading our maintenance guide. 2mm TBX-3 Neoprene: Arguably the stretchiest neoprene available, we've felt a lot of wetsuits over the years but nothing has felt as supple as the TBX-3, so much so that we audibly gasped when inspecting it... Did you know that the 'rubber' inside a wet suit is actually foam? 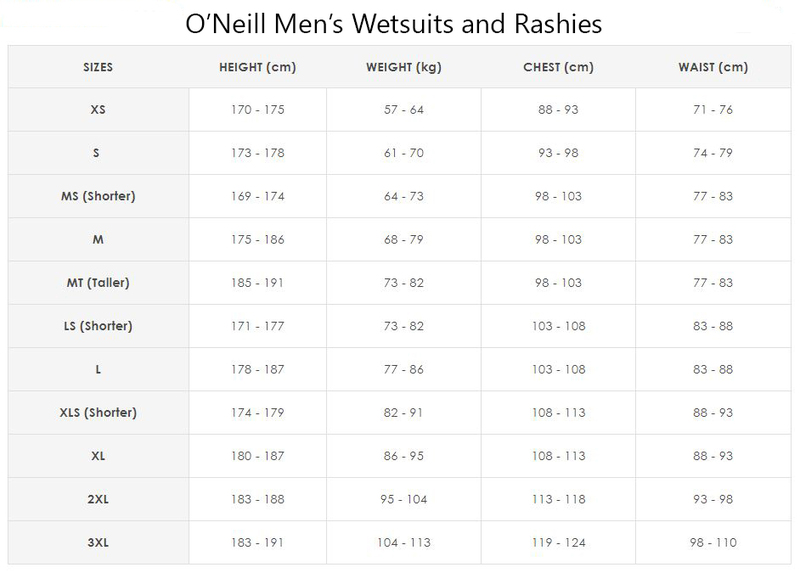 It's important to remember that stretch factor is not dependant on a single aspect of the suit but the combination of the core foam, the linings and the seams - O'neill tout 220% combined elasticity without permanent deformation. Get learned at our Neoprene Blog. Glued & Blind-Stitched Seams: GBS seams use a hooked needle to ensure no pin-holes are made during the sewing stages, as a result the only passage for water is the gap between the two panels but O'neill plug the entire suit with an elastic glue that not only stops all water flow but barely effects the overall stretch of the suit. It's not the most expensive but it's certainly one of the best seams around. Intrigued? Check out our wetsuit seams vlog. Chest Zip Entry: A no-brainer for any performance wetsuit as it's warmer and dryer but drastically increases the entire suit's stretch factor. Read our exposé vlog on wetsuit entry systems. Uninterrupted Torso Panels: Wetsuit stretch is a % function. That is to say: if a neoprene has 200% stretch then 1m can stretch to 2.2m without permanent deformation. If you chuck a seam in the middle of that panel, it won't stretch to 2.2m because seams don't stretch as much as neoprene. Therefore, by removing almost all the seams from your front and back means the greatest possible stretch! Strategic Seam Placement: Oneill have minimised the total number of seams on the Hyperfreak Fuze springsuit which in turn creates a more flexible suit. The same notion as the uninterrupted torso panels!